"he has already achieved an amazing career with his beautiful music. 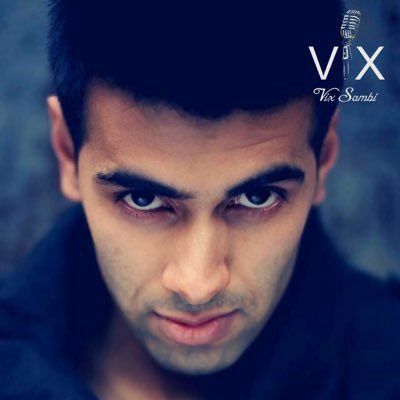 Although there is used some mastering here and there, It is very good R$B music"
Born in 1987 Vix Sambi has been singing and had a passion for music from a young age as he recalls dancing and singing to Michael Jackson (Billie Jean). A self-taught singer and songwriter Vix Sambi always used to sing wherever he was and Went, singing to other artist song's and making up his own melodies, thinking up his own lyrics quickly on the spot. Practicing day after day in his own bedroom studio pushing himself which enabled him to build up a strong and powerful vocal scale. For this artist, the hard work has started to pay off with the good outcome. Dreamed of being a singer, performer, and writer Vix Sambi made it a reality by putting in the hard work and dedication to record his own song's whilst helping other artists along the way. He is very passionate about creating his own material and own unique sound. He is currently working with and has previously worked with various talented artists and producers such as Tariq Khan (LEGACY), Ak1 Productions, Pyro Kenasis, KONVICT) artist Mr. Williams, Janade Miah and Rupture UK. He enjoys spending his time writing his own fresh material and experimenting writing in English and Punjabi. Singing in Punjabi is another talent that this artist has. Fusing and mixing songs up with both his spoken languages gives him more of a diverse sound. Vix Sambi had the pleasure to work alongside Miss Globe 2014, Miss Teen 2014 and some of the UFC, MMA fighters who took part in his music video for song Don't Fly Away. This song also featured one of the musicians by the name of Tariq Khan (Legacy) that inspired Vix Sambi from a younger age to sing. It was truly a dream come true for him to have him feature in his song Don't Fly Away. This artist has performed at many venues such as OXFORD JUBILEE, MISS INDIA UK FINALS 2011, MISS INDIA FINALS NORTH broadcasted live on TV with the star player PETER CROUCH spectating the performances. More venues include the ARABS FASHION SHOW AWARDS 2012 at the Mayfair and 2015 show at the Millennium Gloucester Hotel, London. HORNCHURCH FESTIVAL, HARROW UNDER ONE SKY FESTIVAL, MANCHESTER DONLEY, SLOUGH COMMUNITY GATHERING, LIMELIGHT UK, AURA BAR BIRMINGHAM, INTERNATIONAL WOMEN'S DAY 2015 and many charity events held by the MISS INDIA finalists and other organizations. Performing alongside artists such as (BALWINDER SAFRI, DCS, RAXSTAR, HARVEY SAHOTA, SABAR KOTI). He has had his songs played on many different radio stations in the U.S, UK, Australia, India and Canada. Vix.Sambi has also been in the top 15 RVB Music chart, song's play-listed on BBC Asian Network Playlist. Another feature was by Brit Asia one of the top Asian music channels which aired Vix Sambi music video to be broadcasted on Sky.